The Esplanade at Butler Plaza is a 129,081 square foot neighborhood center located on the north side of Archer Road, between Interstate 75 and SW 34th Boulevard in Gainesville. The property, firmly entrenched in the heart of Butler Plaza, Gainesville's premier retail node, is anchored by a Publix Supermarket and Jo-Ann Fabric & Craft Store. 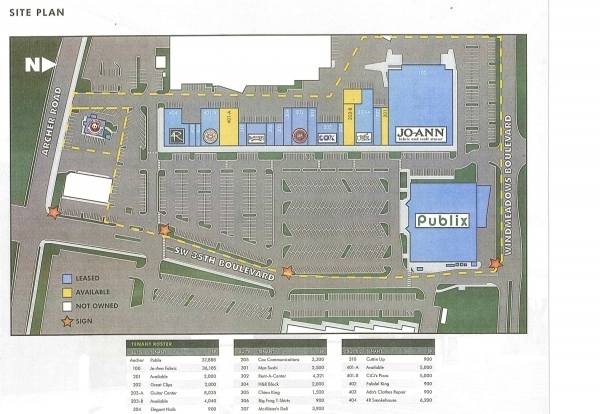 The Property is home to a myriad of national and regional retailers including: Cox Communications, Rent-A-Center, H&R Block, Great Chips, Guitar Center, McAlister's Deli, CiCi's Pizza, 4 Rivers Smokehouse, and a freestanding Panda Express operating under a long-term ground lease.